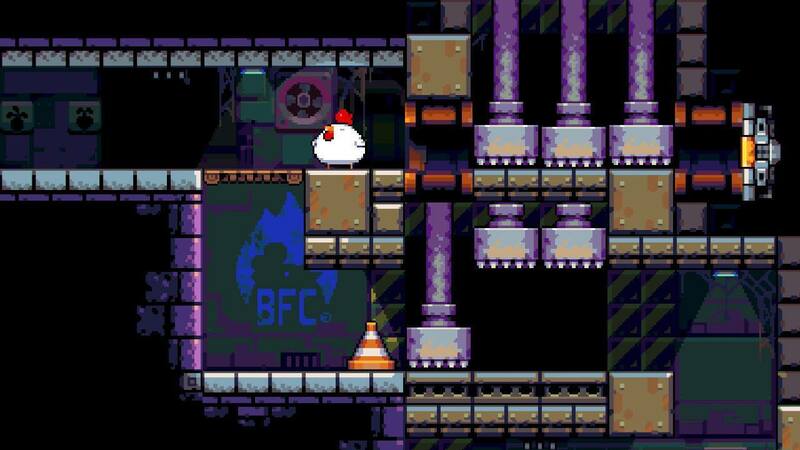 A chicken hatched from an accident with a leaky liquid — BFC’s deliciously addictive, blue hot sauce — becomes an explosive platforming hero with lots of character. Bomb Chicken starts with your chicken hatching from its egg in a secluded storage area, which you must then escape. Thankfully, instead of eggs, your ferocious fowl births bombs. Pressing the B or Y button lets loose a ticking bomb and its explosion blows open the first door, letting you into the rest of the facility. You control the chicken itself using the left stick or d-pad on the controller, and that’s it. There is no jump button, as the vertical movement of your chicken is controlled by laying bombs, which stack in succession (as long as there is a gap in height above you to support it) all the way up to ceiling. The bombs themselves are what makes this game tick. Stacking bombs to reach the exit. With enemies and obstacles galore, it’s a good thing the bombs are so versatile. If you bump into a bomb, you can fling it at a wall, switch or enemy. This, combined with a stack of bombs, allows you to attack enemies at different heights, including flying creatures. You can also use them to weigh down switches and act as a shield (from both poison darts and projectiles), which comes in quite useful during boss fights. Each level starts (quite brilliantly, I might add) with a tutorial room. This area is for you to practice the general idea of what you are going to be tasked with for that particular level. When you finally move to the next room, it ramps up the difficulty. When you run out of lives, it’s ‘game over’ and you’re sent all the way back to the start of the level. Conveniently, you can die over and over again in the first room of each level and you will never lose a heart (the game’s life system). Any time you are hit by enemies or projectiles, or even if you stay too close to your own bombs, you die. Death means restarting in the room you died in. A timing puzzle where you have to hit a switch. 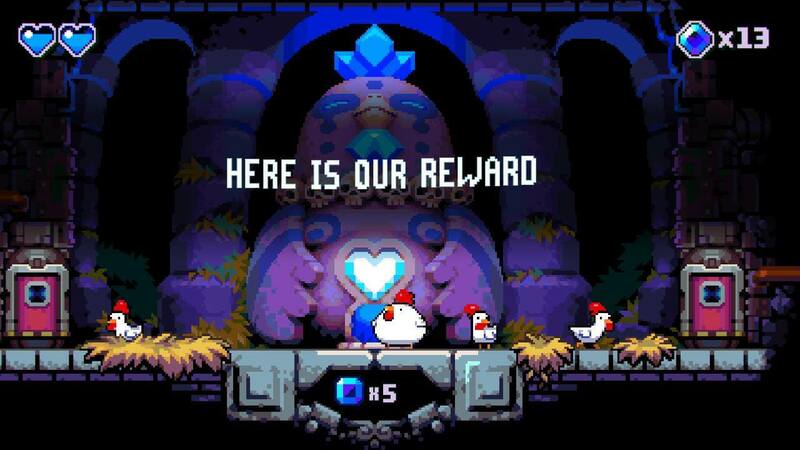 I know it seems at first glance like a cute platformer starring a chicken, but this game is brutally hard at times. I often found myself trying out new ways of handling combat situations, but the puzzle sections are rarely solved by anything other than one specific way. Timing is also one of your foes, as unreachable, timed doors and switches require you to wait till the bomb nears explosion and bump it at just the right time. The bosses follow typical pattern recognition, but that, combined with your limited movement options (using explosive devices, I might add), ramps the difficulty up to much more than the typical ‘shoot ‘til it dies’ method seen in many other games. 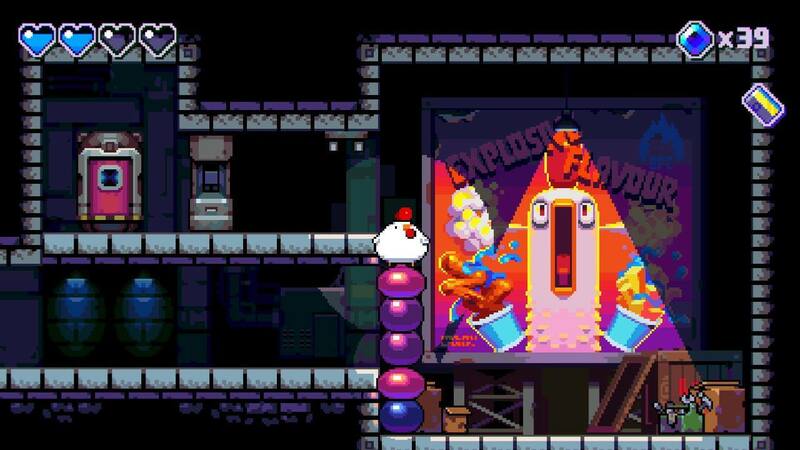 If you were expecting a lovingly crafted story in Bomb Chicken, you will be quite disappointed. Beyond the initial scene of the egg hatching and Mrs. Chicken popping out, the only dialogue delivered is through propaganda posters (you are escaping the factory where they make fried chicken from chickens such as our hero, after all) and a talking chicken statue in between levels. Besides clucks and other various chicken noises, your chicken doesn’t talk. Maybe she knows what BFC stands for, but in the meantime, we will never know, as it’s not revealed through gameplay. With three different ‘worlds’ to tackle, there’s a bunch of variety to the obstacles in each area. Within the walls of the factory, switches and smashing mechanisms used for processing chicken serve as formidable obstacles. Deep in the jungle, poisonous darts and tribal-masked enemies attempt to trip you up. Finally, in a lava-filled Bowser-esque cavern, turrets that fire electrifying shots, flying enemies (that require you to blow up or bounce on their heads) and pools of lava put up a fair challenge right up to the final boss. 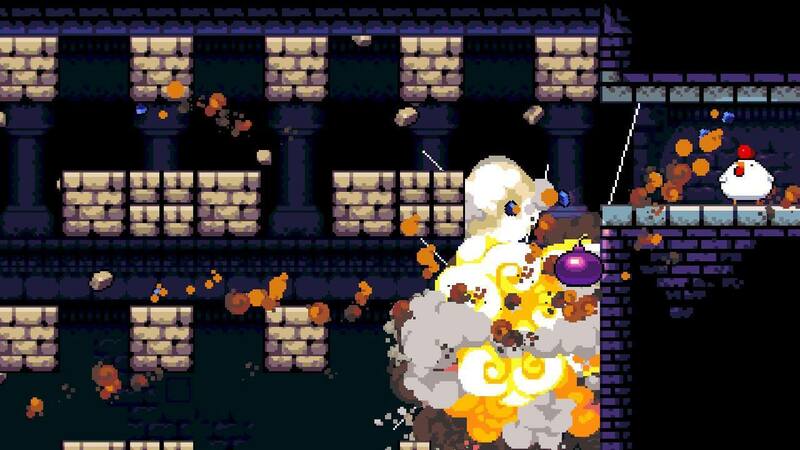 There are twenty-nine total levels in Bomb Chicken, with two boss fights. Throughout each level are blue gems — some in plain sight and some hidden off the beaten path (even behind cracked walls) — to collect. You can use these gems to purchase additional lives between each level, redeeming them at a huge chicken statue, which delivers ominous messages upon each encounter. Beyond that, there are no secret levels. The entire game took me about four hours to beat in total, with approximately six hours to go through and collect all the gems. I feel that the low price is fair and fits the length of the game. Trading blue gems for an extra heart. Overall, I have no complaints of Bomb Chicken. The HD rumble really shines as you feel every explosion. Its crisp, clean graphics would feel right at home on a Super Nintendo and while the soundtrack isn’t really that memorable, its chiptunes melodies fit the game perfectly. It does what it means to do as a puzzle platformer and while difficult, the challenge feels fair and encourages you to simply get better at the game mechanics. Bomb Chicken is currently available on the Nintendo Switch and is coming soon to PC. You can get more information about the game at their website or follow Nitrome on Twitter.